The casing (outer tube on Secure Seal SSD) is manufactured from type 441 stainless steel to provide long-lasting performance and stability when exposed to the outdoors. 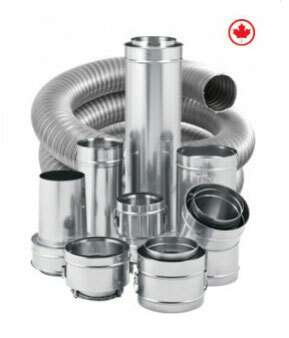 The air space between the flue and casing is 1″ on SSD, providing close clearances to combustibles, reasonable outside dimensions and an additional heat shield or margin of safety where needed. The Secure Seal double-wall system is fully interchangeable with our Secure Seal single-wall system. Both have been conformed to UL1738 and certified to ULC-S636 safety standards. When installed according to Security Chimneys’ installation instructions, Secure Seal meets all test requirements for horizontal and vertical, interior or exterior installations.